My name is Ronny Lund and together with my wife Hanna Engström we own the Ekeskogs Farm in Gotland, Sweden. I was born in Visby, Gotland in 1959 and for the most part of my life I have lived on this island. At a very young age my father took me on my first hunt, carrying my own wooden rifle. I still remember walking with him in the woods of Gotland absorbing all the beautiful nature has to offer. Ever since that day I have had a passion for the nature and wildlife in Gotland. I consider myself very privileged to be the owner of a farm that has its own hunting grounds, many beautiful horses, hunting dogs and other animals. 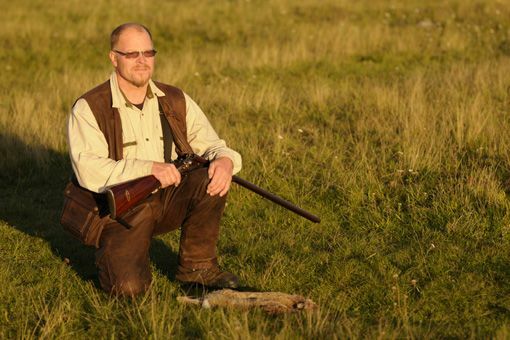 Hunting in Gotland is a magical experience which I want to share with you through this website. I would be honored to be your host and provide you with a stay at my farm in one of our cottages and be your guide during the hunt. The hunting at Ekeskogs farm and the hunting trips I can offer you on Gotland are meant to be a experience you will remember for the rest of your life. The hunting experience I provide are centered around safety, respect for animals, responsibility for nature and a friendly atmosphere. And last but not least: another great passion of mine is preparing you a wonderful wildlife meal in our “Ekeskogs Restaurant” that will be opened in fall or winter in 2011. Your are very welcome on Ekeskogs farm, Rony Lund.